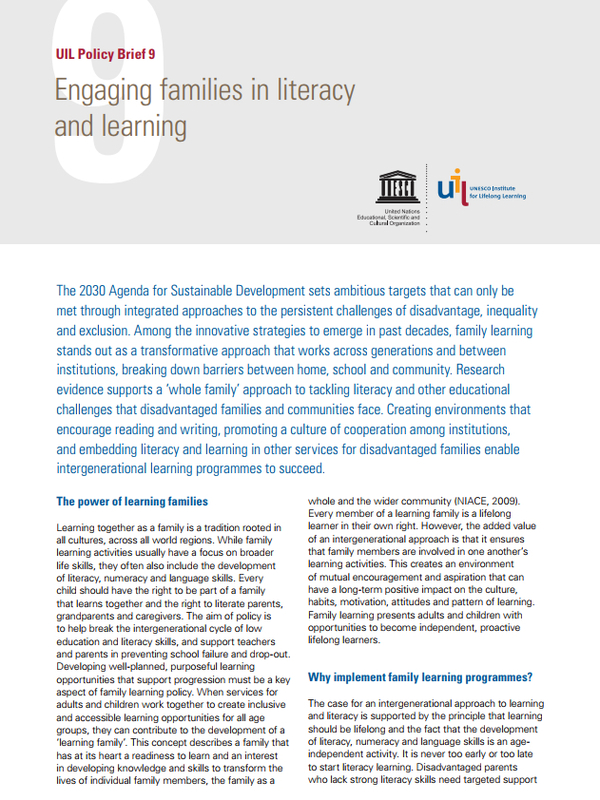 To promote family learning and support policymakers in realizing its potential to improve literacy and other learning skills of disadvantaged families and communities, the UNESCO Institute for Lifelong Learning (UIL) has published a new policy brief "Engaging Families in Literacy and Learning". Offering an analysis of the values and benefits of family literacy and learning, the policy brief advocates family learning as a holistic strategy to be integrated across early childhood/pre-school/primary education, adult education and community education. This approach shows the transformative power of family learning that can help achieve a range of important targets across the full spectrum of the Sustainable Development Goals. • Use a ‘whole family’ approach to address literacy challenges. • Focus on the creation of literate environments. • Promote cooperation using flexible funding streams and reporting approaches. • Link literacy and learning to other services for disadvantaged families. • Use family literacy and learning to break the intergenerational cycle of low education levels.